Unfortunately my ordered parts didn't show on Friday which limits me on what I can do with completing the power supply module. I took most of the day off Saturday to go diving (first chance in 2 weeks!) and had a great time with several of my friends. I got back and started on the computer with the CAD program to design a new motor controller cover for the new fan grills. That's all done now, I'll machine one out tomorrow. I also designed a mounting plate for the power supply module but the CAM program isn't cooperating. I think it's too late for catching the issue so I'm taking a break until tomorrow. I'll try and get some photos taken of the new stuff and the changes. I'll probably build another motor controller assembly to ensure all the clearances are good, the base plate is getting crowded really quick. I'm looking for some RGB LED strips about 3 inches long with at least 3 LEDs. They need to be individually controllable as I want to connect a Prop Quickstart board up to them. Any suggestions? It's been a long weekend of working on the robot. The motor controller assembly is almost done mechanically, just need to attach the plate for the cable plugins. It turned out pretty good with the new fan grills and the black plastic covers. Once I got the technique down for machining thin plastic parts I ended up spending a lot of time creating all those pieces. The Molex plugs and receptacles showed up Friday, discovered that the crisper I have is to small for .093 and .062 pins. Searched around town but couldn't find anyone that carried a Molex crimper. I'll have to order one off the Internet instead. 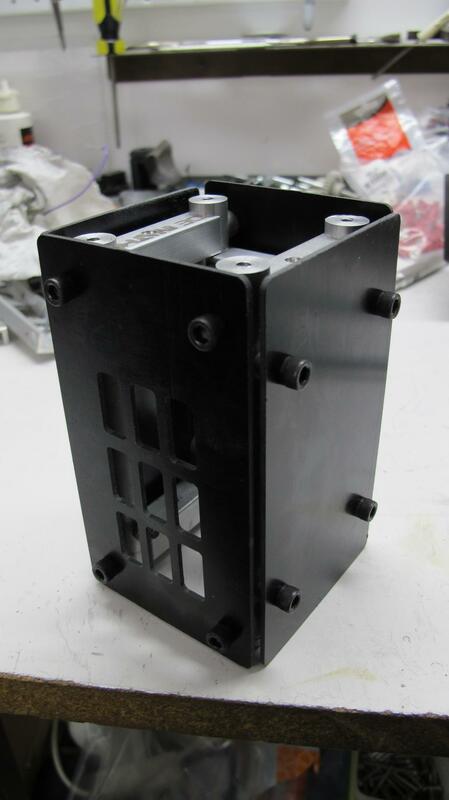 In the meantime the housing is done for the power distribution assembly. It looks pretty good, now I have to wire the distribution wiring together. I also created the panels for the battery housing. Finished drilling the battery tray supports to fasten the panels to but only got 8 of the 16 holes tapped before calling it a night. Here are photos that I took during the process over the last few days. This is a pile of basic parts for the motor controller assembly. On the left side of the photo is one put together. Although this setup works, I got a better idea to use Delrin instead of aluminum for the spacers which eliminates a bunch of machining steps. I'll re-use most of the spacers for mounting a plug panel on the backside of the assembly so not all this work is wasted. This was another example of why I should only create one item at a time so when a better idea comes up (or the original idea just doesn't work!) there isn't as much wasted material and time. 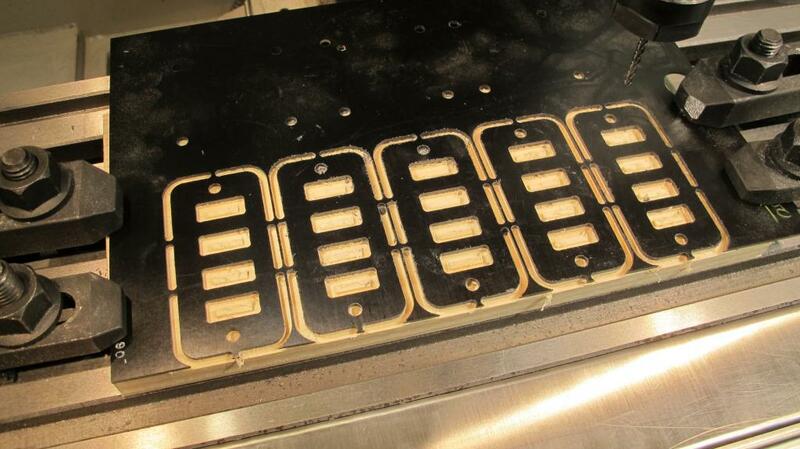 Here the HB-25 controllers have been mounted on the delrin spacers. Another advantage if the delrin is that I found the heat sink on the HB-25s is grounded so this electrically isolates all the motor controllers. 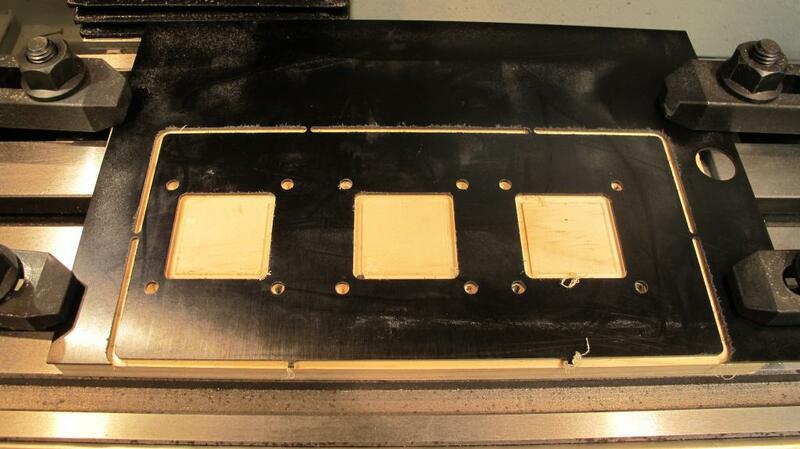 This is a shot right after machining some 0.07 thick black plastic for the cover plate. 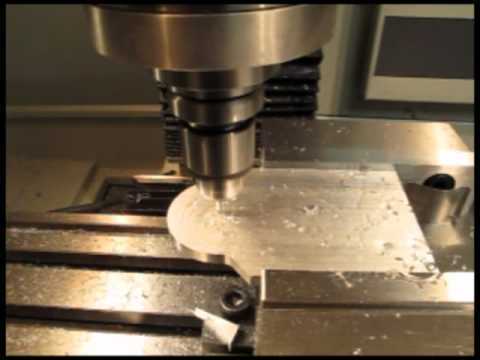 This was done using .125 inch carbide end mill rotating at 10,000 rpm and traveling at 40 inches per minute. There are small plastic tabs left in the cutout that are broken off and then filed down. This prevents the plastic piece from prematurely detaching and becoming an airborne Frisbee (I had one piece imbed itself 2 inches into the drywall beside the mill)! This is the back side of the assembly. The plugs are for power and the 3 motors. This saves on fiddling with those tiny screws on the HB-25 all the time. The final position of the plug panel is probably going to change so that it is facing down to reduce interference with the controller behind it. Here are the plug panels being fabricated. 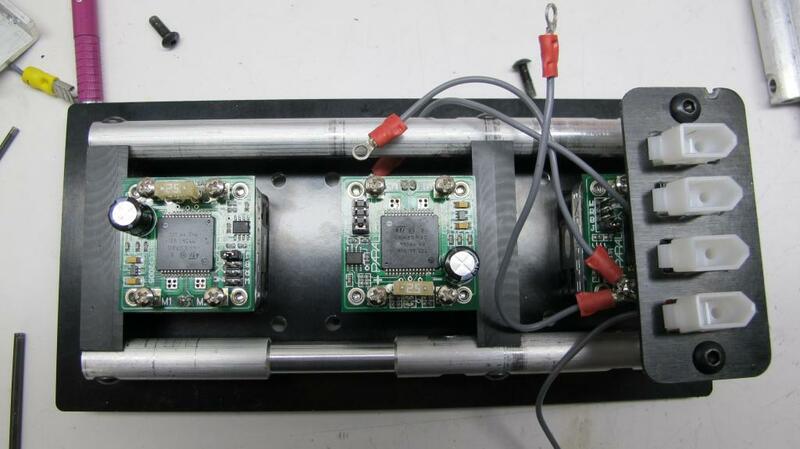 Here is a shot of the power distribution assembly. Each of the 9 spots has a 2 pin Molex connector installed. There are 9 more plugs on the other side. 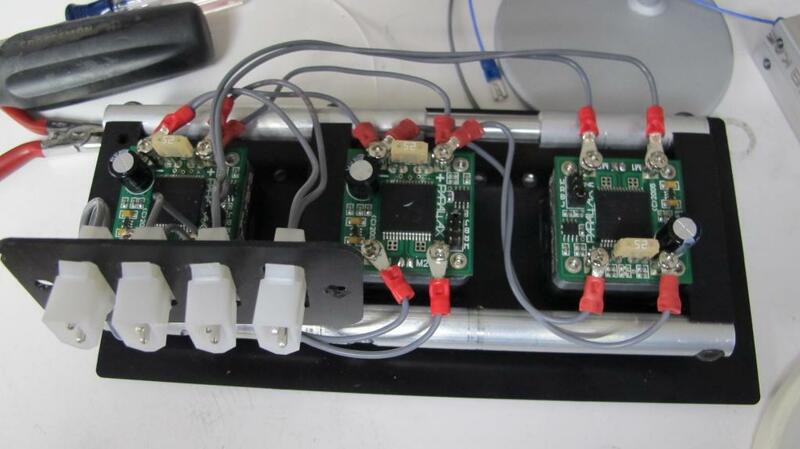 Each plug panel supplies 3 legs motor power and computer power from separate batteries. The other 2 sides will have the main power relays attached to them. Here is where the power distribution assembly is mounted so the power cables radiate out to the 6 legs. 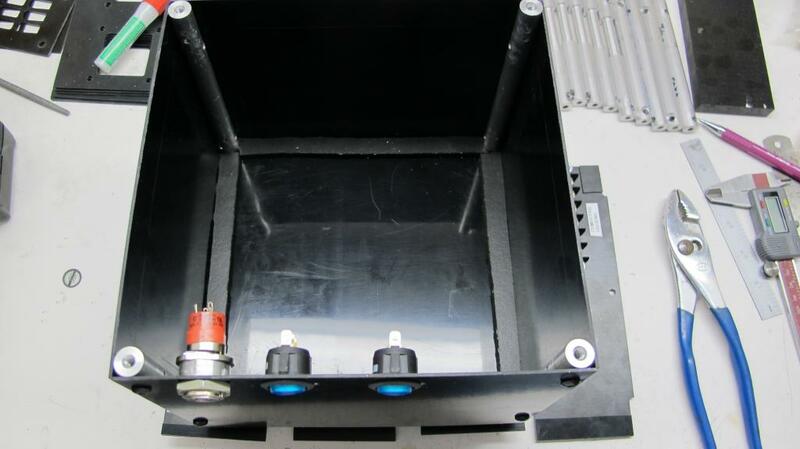 The main battery is located below the bottom plate and the main power lines feed up inside the assembly. 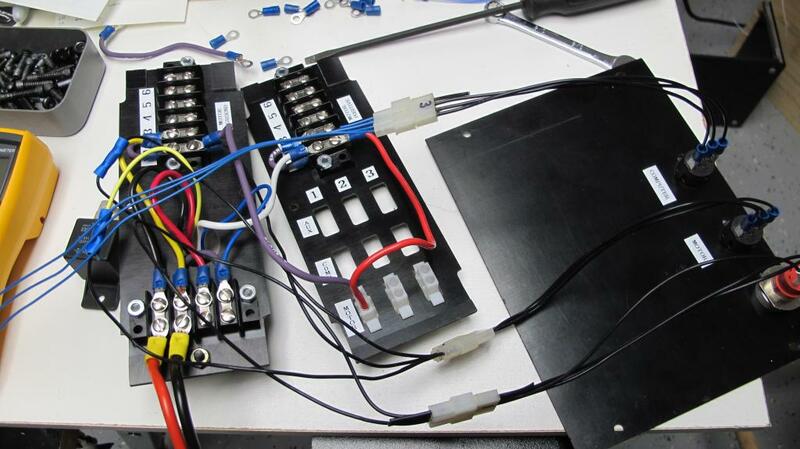 This was designed to minimize the 'rats nest' of wiring that normally seems to occur. It will also make it easier for troubleshooting, assembly/dis-assembly and future add-on. I was pleased with the final versions of the parts, still need a few tweaks but everything is going in the right direction. I need to get the power distribution part done quickly so I have some time to start some programming. Only a few weeks until the Norwalk Prop Expo and I want to have the leg under full computer control by then. Hey Diverbob....can I borrow EVERYTHING in your workshop? In all seriousness you have an amazing project going here keep it up! I call it "Having fun til it breaks...then makn it harder to break"
Looks like some good progress, nice pictures thanks for the update! Finally got almost all the parts I need for the main power distribution system. Unfortunatly they won't all fit inside the assembly I constructed. After a couple of days thinking about it I came up with a relatively simple modification to the assembly that should not only give me the room i need but also be easier to make future modifications. I'm updating the CAD files this morning and plan on cutting the parts later today. Then I can finally start actual wiring! This was a wrong turn but easily correctable. I was able to borrow a Molex crimper so that saves some money, I thought I had one but it was for smaller connectors. I'll post some photos after the weekends work is ready, the camera is downstairs ready to document everything. It was a busy weekend, started wiring and finding out all the wire and terminals that I thought I had were either not enough of them or thy were the wrong size! I made 3 trips to the local hardware store just because I wasn't thinking far enough ahead to get everything on one trip. Saturday I got all the new panel pieces milled and fitted. Made some new brackets for the panels and drilled some new holes in the robots base plate for the battery housing and power distribution housing. After a break this morning for a nice fresh water quarry dive with some friends it was time to actually start wiring things together. I had made up a wiring diagram which I loosely followed and did the distribution power and then the relay control circuit with a key interlock and power switch for the main power relay. I still need to wire up the computer power distribution but it is almost identical to the motor distribution layout. The rest of my parts should arrive Monday so I'll be able to install the relays and test the system with the battery installed. 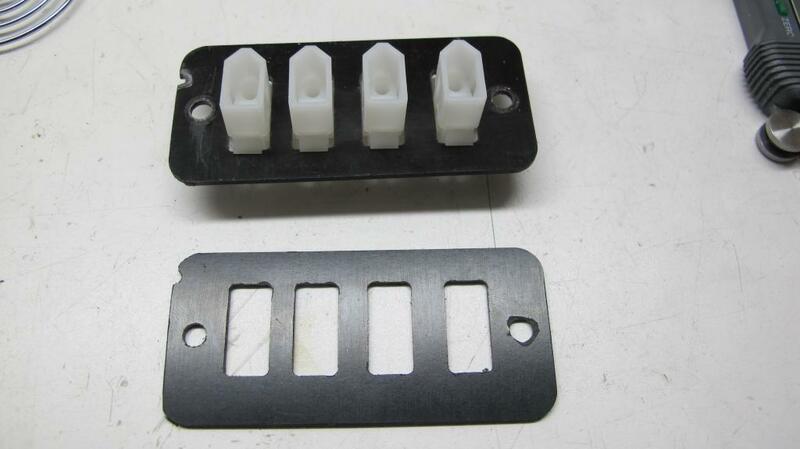 I have to return the borrowed Molex crimper, need to get one of my own! I took photos but since there isn't much to see except for a mess of wires (I want to neaten up the rats nest!) I'll wait for a couple of days before I post them so I'll have something that makes sense. 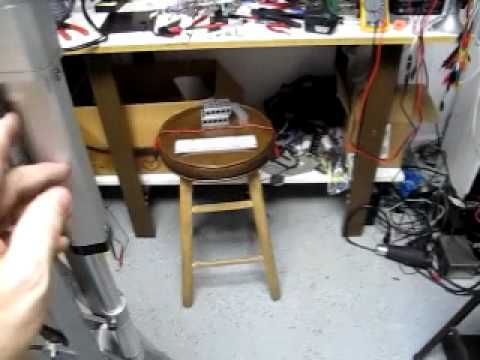 The motor wiring for one leg is done and tested. 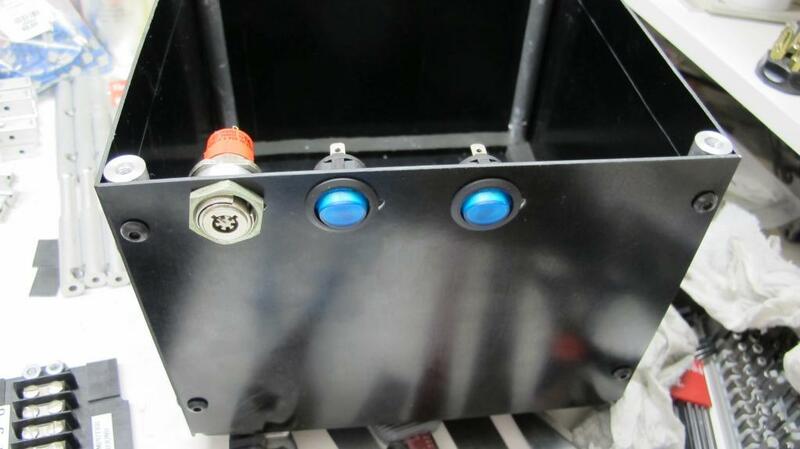 The power plug panel on the motor controller assembly has been mounted also. I made up power cables to the motors using in line fuses to provide some additional protection. Tomorrow I'll be soldering plugs on the potentiometers and microswitches. This will simplify setting up the leg computer. I changed my mind on the power distribution again! I started to worry about the impact of induced voltages in the computer power system so I'm going to put the computer power distribution separate from the motor distribution. Between that and several large caps, should keep voltage fluctuations to a minimum. Off the top of my head, the Eddie Control Board comes to mind. It has an eight channel A/D, but one channel is used for the Battery Sense line. Taking a break to fill scuba tanks for tomorrows dive. I've been working on the wiring from the sensors to the computer. I'm ready to start soldering that next. Here are the promised photos for current status. 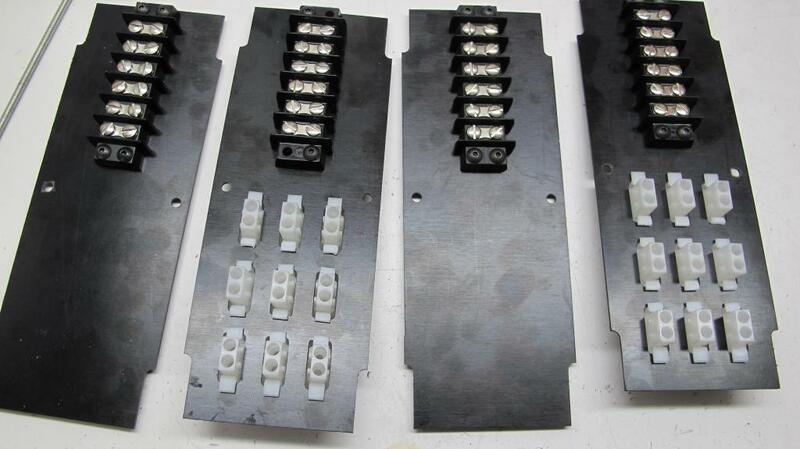 This photo is the center of the base plate and shows the mounting brackets for the power distribution panels. There will be matching blocks on the underside of the top plate. I also drilled a 1 inch hole in the center of the plate for passing the battery and switch wiring through. These are the four distribution panels. Originally I wanted to put the motor and computer distribution in here but I'm worried about induced voltages in the computer power so I removed the computer power plugs and terminal strips. I'll mount those outside of this setup. This shows how the power panels slide onto the mounting blocks and are held together by some brass straps. This was taken while I was testing the distribution system electrically, it worked the first time! This is the motor controller assembly fully wired and the connector plate installed. This shows the power distribution control switches. The key switch is the master control and the other switches are for the motor and computer supplies. These are mounted on the side of the battery box which may not be easily reachable in the event of an emergency so I'll probably add another more easily accessible switch for programming and testing the software in case things get out of hand! Got all the motors connected and the sensors hooked up and tested. Only ran into a couple of wiring errors that took some time to figure out. One problem was that apparently one channel on the MCP3208 ADC wasn't working right so that really took a lot of time to figure out. I kept asuming it was my programming since I'd checked the wiring several times and verified signals with a multimeter. Yesterday night was spent calibrating the Femur and Tibia motor and creating a table of position values. The motor routines work very well and will be a good basis for the kinematics work later. Tonight I was working on the Coxa calibration which turned out to be a lot harder than the other two axis. I finally determined that the precision pot I'm using on the Coxa is very linear so I'm just using the slope of the line to calculate the position. At least that is the plan, in reality the programming thinking cap isn't cooperating tonight. It just wants to slam the leg to one extreme or the other. This is definately a programming problem and it's to late to figure it out now. I'm diving in the morning and will get back to it in the afternoon, things should be clearer then! Another thing I've decided to change is the Coxa limit switch. I currently have just one limit switch that activates when the leg swivels 60 degrees either direction from the centerline. Programming a single limit switch isn't working out so well, I am adding in so many conditions it detracts from the code. The problem is that if the Switch is tripped then you stop the motor but how do you tell it that its ok to run the other direction? Ive tried Reading the ADC to see which direction its gone but that seems excessive. Ill give it one more go and if that doesn't work I'm going to design a new setup with separate limit switches for each direction. That will be a lot simpler to program and troubleshoot. Parts came in from McMaster Carr, I don't think there is much they don't carry. Assuming I figure out the Coxa program, I'll be writing the 'let's see what breaks if I run it for a long time' test. That should be fun to watch! Herculean effort, Bob! Beautiful work, you are really setting the standard for construction and documentation! My only comment is to keep an eye on the overall weight, all those beautiful "lightweight" parts add up surprisingly fast. 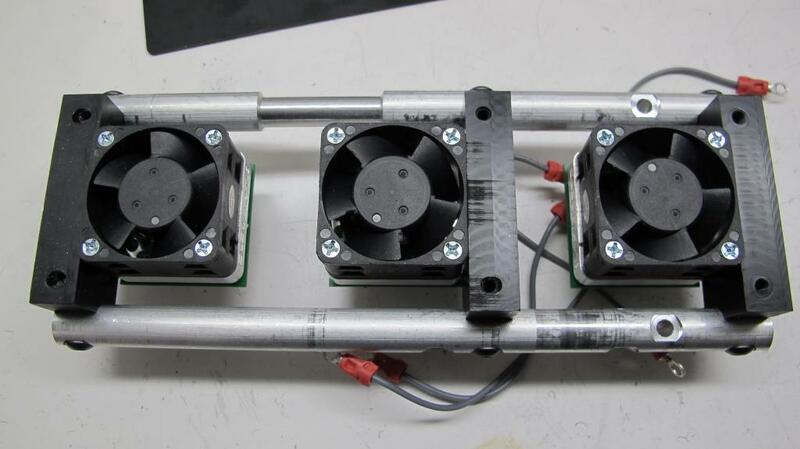 With each actuator capable of moving 110 lbs, weight hasn't been a big concern! I've found some other 12v linear actuators capable of 250 lbs and a speed of 2 inches per second... A little pricy but they would fit with a little modification. I'm still heading to stay under the target weight of 170 lbs. I mainly want to see what the overall speed will end up as when this is walking, I'd like something faster than 'lumbering' and slower than out of control. Back from my dive, all refreshed and ready to get back to troubleshooting the programming. At this point there isn't much to show by way of photos but I will run video of the stress test later. The only photos at this point is of the rats nest of signal wires into the breadboard! 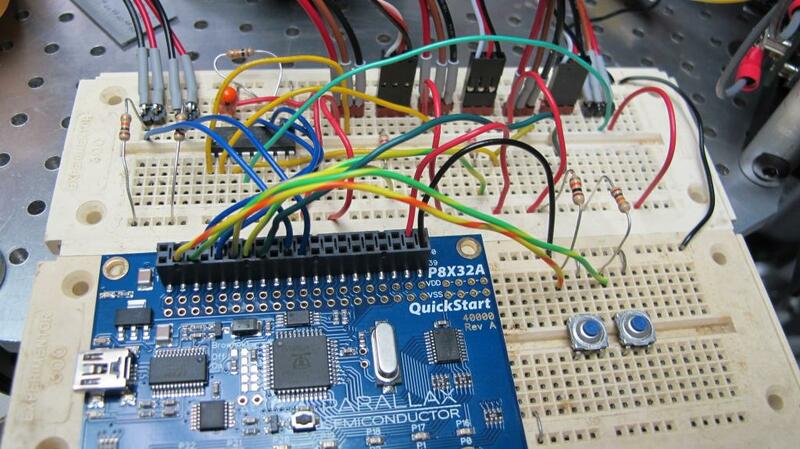 Here is a photo of the breadboard setup, pretty messy right now. Lots of IO plugged in along the top for the prop to handle. I may try to run 2 legs per prop board but I'm limited due to the number of IO that each leg requires. Got the Coxa motor program routine running so started programming the stress test. I started with running the Femur motor up and down 20 times without an issue. The next test was the same thing with the Coxa motor, after several back and forth passes it started to hesitate while moving. I determined that one of the gears was slipping on the shaft. Took the reduction gear apart, preened the gear shaft, press fitted the gear back on. No more slippage but got some other unexpected movements. This time the gear shaft had popped out of the bushing causing problems. So the gear reduction was disassembled again but I can't get one of the gears to come off the shaft. Next step is to drill the shaft out and make a new shaft. I'll see about ordering some additional gears anyway, they'll be put to good use! The stress test is being successful in finding design weaknesses! As I was playing around I discovered there are positions that the tibia motor can't get to its full extension depending on the Femur position. This is occurs when the Femur is fully extended, there isn't room for the tibia to kick all the way out. I'm not sure there is an answer for this, I may just have to program around that condition. This was the first day of my 'stay'-cation! Got a lot done on the motor controller assemblies. Machined all the parts for the assembly, the only thing left is to tap some holes and put all the parts together. Depending on when my gear order shows up, the next step is to drill out the old shaft and machine a new, longer shaft. I'm also going to machine the Coxa motor housing assemblies since those are not going to change either. Hopefully the later half of the week I will be able to concentrate on programming and start playing with some Inverse Kinematics routines. I'm still taking photos and videos of the process, I'll have to edit the videos into something that makes sense and get that posted. Luckily I have a very understanding wife who lets me spend a lot of time on this (it doesn't hurt that the Olympics are keeping her occupied too!). Here is a video link for the last couple of days of work. 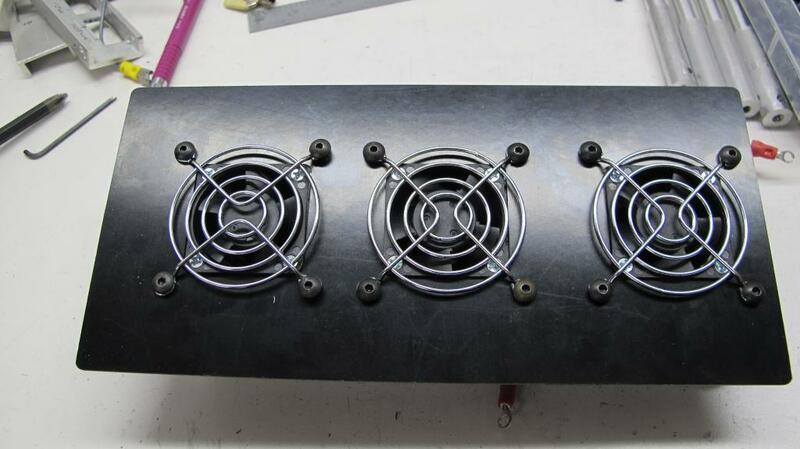 Finished up the assembly of the motor controller modules and mounted them on the base plate. The plate that looked so large before is getting pretty crowded! Starting machining of the leg swing motor assemblies in the morning. 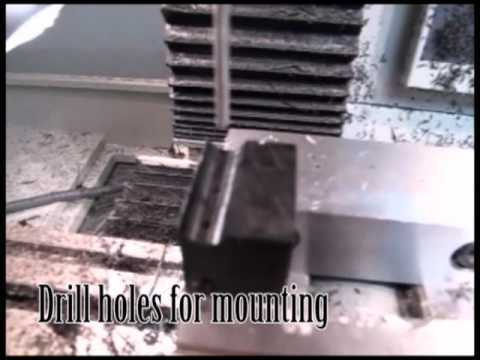 Here is a video of today's work, machining the upper coxa motor assembly mounts. These are used as the pivot points for the leg and are bolted directly to the hexapod body. These videos and photos show the basic processes used for each assembly. I'm continuing to document the build process, it also helps me keep every thing straight and keeps me motivated! I also got a replacement bolt for the leg down sensor; the bolt is increasing in size from a 1/4 to 3/8 diameter and is a hardened steel that should resist bending. There will be a bit of modification to the housing to accomodate the bolt also. Since I got my gears in the mail I'm going to fix the gear reduction on the Coxa. That will be after a break for racquetball and a bike ride. So tonight will be working on the lathe for a while. God I cringe watching it work that close to the sides of the vice! Nice videos. Love watching that machine of yours work. No photos today, a lot of tear down, manual lathe work and then putting it all back together again. Tomorrow I want to make the other reduction gear housings, that will put the mill to good use! I usually try to stay further away from the vise jaws but I was getting to much vibration that was showing up in the finish. I almost always 'air' cut and single step the first round of any part to verify that I don't get unexpected crashes. It doesn't always work, the top of the vise has several gouges from incorrect cutter length compensation. Luckily jaws are replaceable! Another day gone by and a little bit more done. First thing was CAD work on the reduction gear setup. That was converted to G-code and verified. Once that was done, material was loaded into the mill for cutting. Everything went as expected and a new motor mount was completed. I disassembled the old motor mount and put in the replacement. This exposed a problem with the gear shaft so back to the lathe! After two attempts and several tweaks to the design, I finally got a shaft that works. That pretty much took up most of the day. Tomorrow will be milling the rest of the mounting plates, side panels and worst of all, tapping 6 times 16 holes in the plates. That will make for a full day! Since its supposed to rain all day I shouldn't get distracted too much! 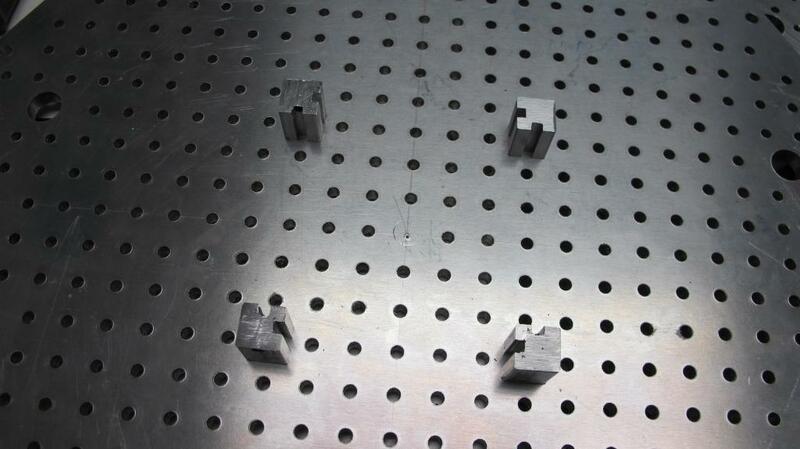 Productive day, all the parts for the Coxa assemblies have been milled out. I have some cleanup work on some of the pieces to do yet and still have a lot more hand tapping to do. I finished one assembly and test fit it together and every thing fits without 'tweaking'! 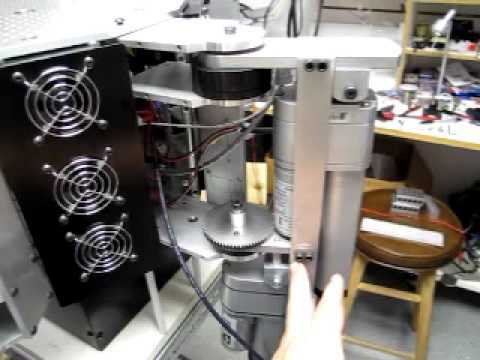 I should finish the tapping tomorrow and put all the assemblies on the base of the robot. It should start to look like something then. Once I get the test leg reassembled I'll get back to the programming and initial stress test completion. It's late but I'll have more video and photos soon. I'm spending too much time in the basement and little time on the computer prepping the camera files. I'll make sure to set aside some time later this weekend. 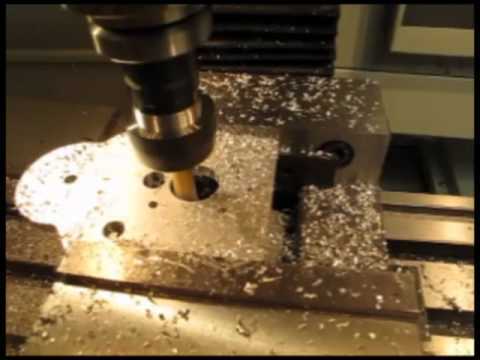 Here is a video of the Coxa assembly; finishing machining of parts and then assembly into the Coxa assemblies. I still have one more assembly to hand tap, my arm was getting too sore to finish today. 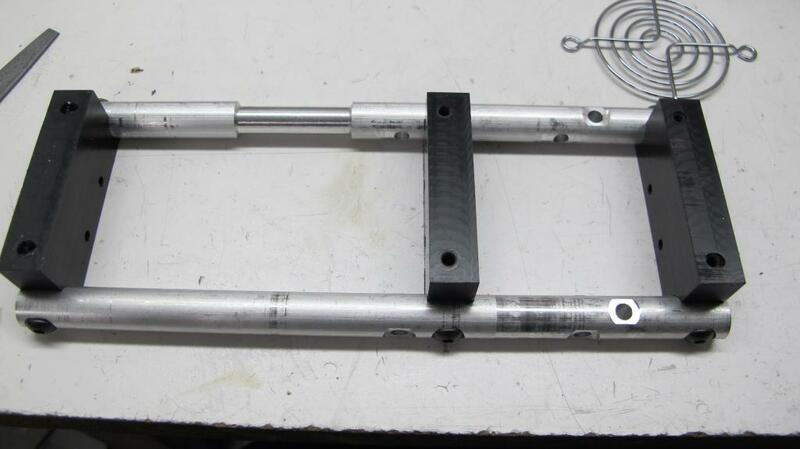 Ran out of time to put the test leg reduction gear assembly back together, will do that tomorrow after diving. 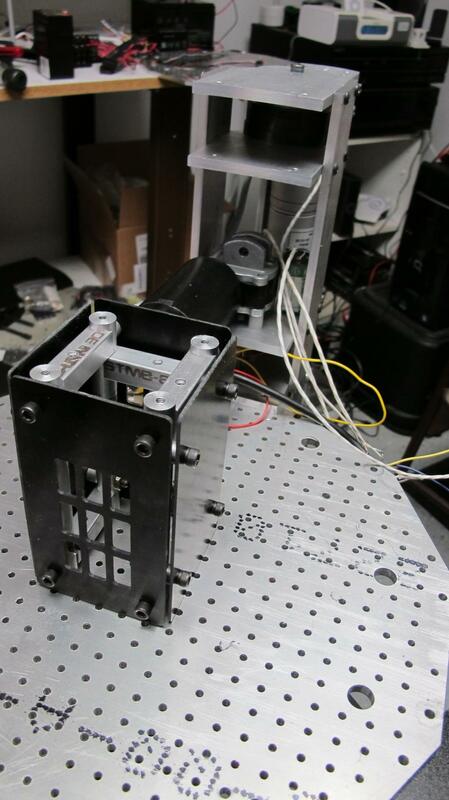 Once that is together then calibrating the Coxa assembly and continue the stress testing. 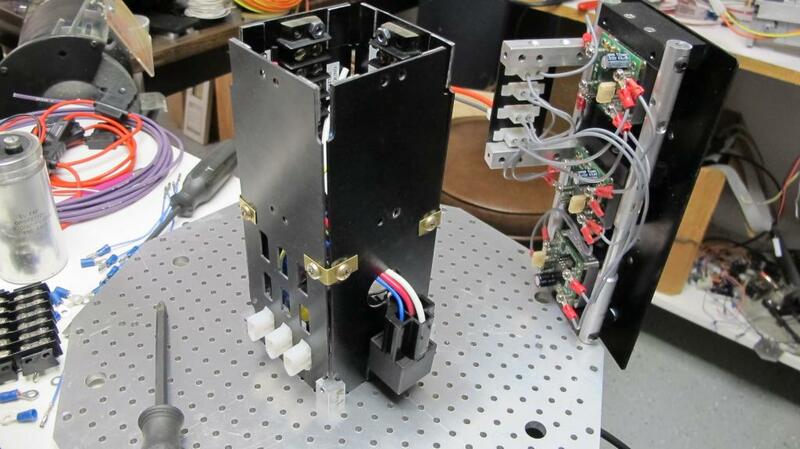 Here is a 2 part video walk through of the current status of the hexapod. 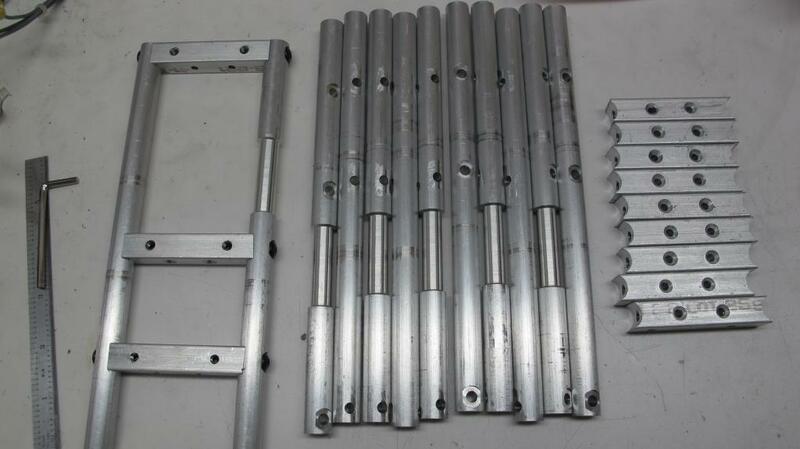 These show the assembled parts on the hexapod. This completes most of the mechanical work I expected to finish before the Aug 25 Expo. The only remaining mechanical parts I want to finish will be the force sensor housing modifications and the attachment points for the housing. Today was a diving day (2 dives in Lake Michigan, 50 degree water to wake you up!) so didn't get much completed today. I have the reduction gear assembly to put back together then the coxa can be calibrated again for testing. Planning on continuing testing the various joints to see any weaknesses. I've already found several screws that want to unscrew themselves, replacing those with lock screws. I have to keep everything tight to minimize side to side flexing which could cause linkages to bend and throw out the alignment. Last weekend before the Expo! Got lots of work done, finished the modifications to the knee housing that contains the force and leg down sensors. This seems to work OK under program control but I found when swinging the leg side to side there is enough inertia in the lower leg portion to briefly register as an impact. This causes the swing to stop prematurely. There are a couple of potential solutions to this problem. First, I could use a heavier duty spring which would resist the tendency of the lower leg to impact on the force sensor with the drawback that it would take more weight to set off the leg down sensor. The other option is to add another o-ring to the bottom of the knee housing that would resist the leg from moving from side to side. I'm going to try option 2 first (after the expo, not enough time to get that up and running just yet). I am continuing to study Inverse Kinematics and I am starting to get a handle on the concepts. The only thing that is still eluding me is how to determine what location the leg tip should be at. Since Inverse Kinematics gives the needed angles for the 3 motors to move the femur, tibia and coxa to a specific x, y, z position, how is that x, y, z position determined in the first place? It seems that it is coming from the gait generation but I just don't get it yet. Time for some more studying! I've downloaded and printed several Inverse Kinematics documents and source codes and hopefully something in there will finally make sense to me. Looking forward to the expo next weekend, will be arriving Friday at the Best Western in Norwalk. Hope to see lots of you there! Made it to Norwalk for the Propellor Expo, everything in the car seems to have survived the trip! I had to disconnect the test leg in order to get it out of the basement so the first order of business will be re-connecting everything tomorrow morning and then testing. Looking forward to seeing everyone again and maybe some new faces. Stop by and say hi! 1) Why did you have to disconnect the leg? Size, Weigh t(mass), or Other? 2) Will it be able to walk out on its own with all six legs installed? Just curious. I could wait and ask you in person in about half an hour. The size and weight made it awkward to carry up the basement stairs and for strapping it down in the SUV so it wouldnt roll around. Time to head over to the Expo!